Is the new Samsung Tocco Ultra S8300 up to the task? Samsung's efforts to break the mobile phone market have been going swimmingly thus far; it's been a constant innovator and a leader in pushing the boat in terms of convergence. So will the latest in its long line of flagship handsets, the Samsung Tocco Ultra Edition, live up to the hype of a massive advertising campaign and deliver a handset worthy of the top billing? Or will it be a damp squib in the year of exciting touchscreens releases? Designed to be the jewel in the Samsung mobile phone crown, the Tocco Ultra Edition is clearly specified up to its (virtual) eyeballs with the cream of mobile phone hardware. A 2.8-inch AMOLED touchscreen uses the latest in display technology, with the active matrix OLED giving brilliant colours and a deep contrast ratio, as well as being low on battery power. The 8MP camera is the most detailed available at the moment, and incorporates a dual LED flash to help bring night pictures to life. Assisted GPS is included as well should you feel the need to geotag photos, or just get involved with some Google Maps fun. The overall feel of the device, clad mostly in grey but with a stripe of red down the side (as well as the keypad) is an odd combination but works very well, giving the handset a refined and stylish look. The mark of a good phone often comes from the feel in the hand (the iPhone excepted) and this handset is up there among the best. Although it has a brushed aluminium front framing the touchscreen and a plastic back, it feels solid and weighty in the hand and fits nicely when slid up or down. However, the sliding action, especially one handed, is a little bit uncomfortable, especially when the ergonomics dictate that you must press the display to slide up the phone by placing a digit on the touchscreen - it took a long time to get used to not accidentally activating an application on the screen, and even after some familiarity it wasn't easy to avoid. A number of buttons around the side allow you to control things like volume / screen zoom in differing applications, a camera key (that can be re-configured to access the media icons, ie music player, browser, main menu, calls and games) as well as a lock key and the charger / headphones adapter socket under a dust cover. These feel fairly poorly positioned, as apart from the volume up and down buttons the others all require you to move the phone in your hand significantly to access them. The lock key in particular is frustrating, as it requires a long press to re-activate the screen. 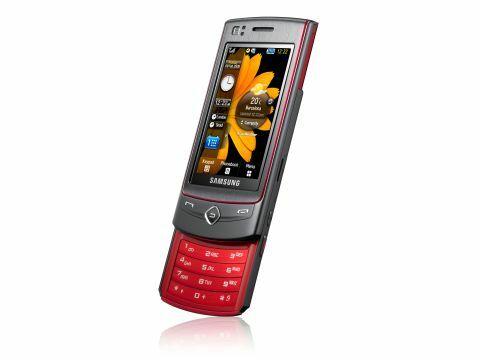 The Samsung M8800 Pixon uses the same OS and button system and only requires a short press - you can see why a longer press is more likely to keep the phone from activating in your pocket, but given the amount of times it is used in your hand it's particularly annoying. We found it easier to simply activate auto lock in the settings, meaning that you only have to slide the phone up and down to unlock. The front three keys, call / terminate and a back button, are well-placed; however we can't help but feel that the central key, which is in the middle of a small diamond frame, should have been a direction key as well allowing navigation around the screen, but it still feels nice under the thumb.